Curved screens are applied for separating solids from process and wastewater. The curved screens are robustly built and require a minimum of maintenance and attention. The raw wastewater is pumped over a curved, wedge wire, screen plate where separated particles slide down, due to gravity and the screened water leaves the screen via the outlet. The screen can be equipped with a programmable spray cleaning device in case the wastewater contains fiber-like materials or fat. 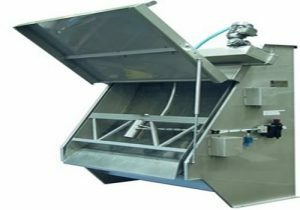 For very heavy polluted wastewater, a vibrating screen plate can be installed in order to guarantee clog-free operation.